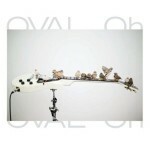 Fast-forward to 2010, and Oval is back with a new EP, prelude to a full length double album due out later on this summer. Comprising no less than fifteen tracks, covering a mere twenty-five minutes, Oh represents quite a departure from the granular electronica that has been at the core of the Oval sound since the early days. Instead, he embarks here on a very different journey and relies on surprisingly acoustic sounds, mostly guitars and drums, with virtually no glitches in sight. This is the result of a complete change of working processes. Popp has, for this record, ditched custom-designed software and patches and armed himself with a handful of widely available off-the-shelves programs instead. There is also here a stronger focus on clear melodic structures, although these are often kept to fragments, the tracks rarely reaching over a couple of minutes. It is as if Popp was collecting random ideas, but instead of developing them into full tracks, he purposely kept them in draft state. This is reinforced by the apparent small pool of sounds used. Processed guitars are the main components of these fifteen tracks, with drums also playing quite an important role on the first four, occasionally brining to mind the psychedelic tones of Fourtet, especially on Hmmm and on the title track. Later on, Popp crafts much more minimal pieces, which often shimmer with minute sonic particles, giving them a slightly unpolished feel. While this doesn’t quite define the whole record, it represents a major slant in the approach here. Tracks such as Kastell, Featurette, Kasko or Homesick appear to be more elaborate than they actually are, as sounds are ever so slightly distorted, enough to give them a processed aspect and alter the perception of the listener, but not enough to render them totally unidentifiable. As the second side progressively draws to a close, the mood changes once again to become more introspective. This is reflected in a more straightforward approach to sound sources, which lose their fragmented aspect to appear more natural, especially on Locria and Nonfiction. With this EP, Markus Popp unveils a totally new direction, away from the heavy digital processing of earlier records. The music here appears much more pastoral and elegant, and, instead of focussing solely on sound, caters for delicate melodies, albeit often in truncated form. All this is, however, still unmistakably Oval, and this EP, released at only a thousand copies, paves the way for a long-awaited new album which is likely to expand greatly on the work presented here. Thanks for posting this. It’s a rather short one, but none of the tracks are very long on this release.